Gas-discharge lamps are a family of artificial light sources that generate light by sending an electrical discharge through an ionized gas, a plasma. Typically, such lamps use a noble gas (argon, neon, krypton, and xenon) or a mixture of these gases. Some include additional substances, like mercury, sodium, and metal halides, which are vaporized during startup to become part of the gas mixture. In operation some of the atoms in the gas are positively ionized, losing one of their electrons. The ions are accelerated by the electric field toward whichever electrode is negatively charged at the time. Typically, after traveling a very short distance the ions collide with neutral gas atoms, which transfer their electrons to the ions. The atoms, having lost an electron during the collisions, ionize and speed toward the electrode while the ions, having gained an electron during the collisions, return to a lower energy state, emitting a photon of light of a characteristic frequency. In this way, electrons are relayed through the gas from the negative electrode to the positive. 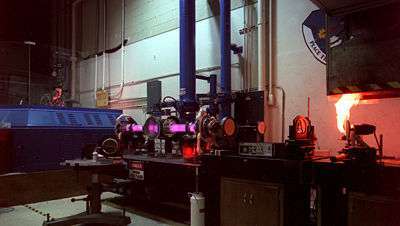 The color of the light produced depends on the emission spectra of the atoms making up the gas, as well as the pressure of the gas, current density, and other variables. Gas discharge lamps can produce a wide range of colors. Some lamps produce ultraviolet radiation which is converted to visible light by a fluorescent coating on the inside of the lamp's glass surface. The fluorescent lamp is perhaps the best known gas-discharge lamp. Compared to incandescent lamps, gas-discharge lamps offer higher efficiency, but are more complicated to manufacture and require auxiliary electronic equipment such as ballasts to control current flow through the gas. Some gas-discharge lamps also have a perceivable start-up time to achieve their full light output. Still, due to their greater efficiency, gas-discharge lamps are replacing incandescent lights in many lighting applications. The history of gas-discharge lamps began in 1675 when French astronomer Jean-Felix Picard observed that the empty space in his mercury barometer glowed as the mercury jiggled while he was carrying the barometer. Investigators, including Francis Hauksbee, tried to determine the cause of the phenomenon. Hauksbee first demonstrated a gas-discharge lamp in 1705. He showed that an evacuated or partially evacuated glass globe, in which he placed a small amount of mercury, while charged by static electricity could produce a light bright enough to read by. The phenomenon of electric arc was first described by Vasily V. Petrov, a Russian scientist, in 1802; Sir Humphry Davy demonstrated in the same year the electric arc at the Royal Institution of Great Britain. Since then, discharge light sources have been researched because they create light from electricity considerably more efficiently than incandescent light bulbs. The father of the low-pressure gas discharge tube was German glassblower Heinrich Geissler, who beginning in 1857 constructed colorful artistic cold cathode tubes with different gases in them which glowed with many different colors, called Geissler tubes. It was found that inert gases like the noble gases neon, argon, krypton or xenon, as well as carbon dioxide worked well in tubes. This technology was commercialized by French engineer Georges Claude in 1910 and became neon lighting, used in neon signs. The introduction of the metal vapor lamp, including various metals within the discharge tube, was a later advance. The heat of the gas discharge vaporized some of the metal and the discharge is then produced almost exclusively by the metal vapor. The usual metals are sodium and mercury owing to their visible spectrum emission. One hundred years of research later led to lamps without electrodes which are instead energized by microwave or radio frequency sources. In addition, light sources of much lower output have been created, extending the applications of discharge lighting to home or indoor use. Each gas, depending on its atomic structure emits certain wavelengths, its emission spectrum, which determines the color of the light from the lamp. As a way of evaluating the ability of a light source to reproduce the colors of various objects being lit by the source, the International Commission on Illumination (CIE) introduced the color rendering index (CRI). Some gas-discharge lamps have a relatively low CRI, which means colors they illuminate appear substantially different from how they do under sunlight or other high-CRI illumination. Helium White to orange; under some conditions may be gray, blue, or green-blue. Used by artists for special purpose lighting. Neon Red-orange Intense light. Used frequently in neon signs and neon lamps. Argon Violet to pale lavender blue Often used together with mercury vapor. Krypton Gray off-white to green. At high peak currents, bright blue-white. Used by artists for special purpose lighting. Xenon Gray or blue-gray dim white. At high peak currents, very bright green-blue. Used in flashtubes, xenon HID headlamps, and xenon arc lamps. Nitrogen Similar to argon but duller, more pink; at high peak currents bright blue-white. Carbon dioxide Blue-white to pink, in lower currents brighter than xenon Used in Carbon Dioxide Lasers. In combination with phosphors used to generate many colors of light. Widely used in mercury-vapor lamps. Sodium vapor (low pressure) Bright orange-yellow Widely used in sodium vapor lamps. Hot-cathode lamps have electrodes which operate at a high temperature, which during operation are heated by the arc current in the lamp. The heat knocks electrons out of the electrodes by thermionic emission, which helps maintain the arc. In many types the electrodes consist of electrical filaments made of fine wire, which are heated by a separate current at startup, to get the arc started. Cold-cathode lamps have electrodes which operate at room temperature. To start conduction in the lamp a high enough voltage (the striking voltage) must be applied to ionize the gas, so these lamps require higher voltage to start. Low-pressure lamps have working pressure much less than atmospheric pressure. 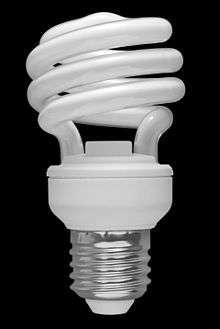 For example, common fluorescent lamps operate at a pressure of about 0.3% of atmospheric pressure. Neon lighting, a widely used form of cold-cathode specialty lighting consisting of long tubes filled with various gases at low pressure excited by high voltages, used as advertising in neon signs. Low pressure sodium lamps, the most efficient gas-discharge lamp type, producing up to 200 lumens per watt, but at the expense of very poor color rendering. The almost monochromatic yellow light is only acceptable for street lighting and similar applications. A small discharge lamp containing a bi-metallic switch is used to start a fluorescent lamp. In this case the heat of the discharge is used to actuate the switch; the starter is contained in an opaque enclosure and the small light output is not used. Continuous glow lamps are produced for special applications where the electrodes may be cut in the shape of alphanumeric characters and figural shapes. Metal halide lamps. These lamps produce almost white light, and attain 100 lumen per watt light output. Applications include indoor lighting of high buildings, parking lots, shops, sport terrains. High pressure mercury-vapor lamps. This lamp type is the oldest high pressure lamp type, being replaced in most applications by the metal halide lamp and the high pressure sodium lamp. It requires a shorter arc length. The Xenon flash lamp produces a single flash of light in the millisecond-microsecond range and is commonly used in film, photography and theatrical lighting. Particularly robust versions of this lamp, known as strobe lights, can produce long sequences of flashes, allowing for the stroboscopic examination of motion. This has found use in the study of mechanical motion, in medicine and in the lighting of dance halls. ↑ "Types of Lighting". Energy.gov. US Department of Energy. Retrieved 10 June 2013. ↑ "Lighting technologies: a guide to energy-efficient illumination" (PDF). Energy Star. US Environmental Protection Agency. Retrieved 10 June 2013. ↑ See Wikipedia's article: Barometric light. Wikimedia Commons has media related to Gas discharge lamps.